If you're looking for an extremely natural-sounding rotary speaker emulation in a decent-sized stompbox, you'll find it in the Lex. Authentic sound. Fast/slow switch. Ability to add expression pedal. Access to secondary functions can be a bit fiddly. The sound here is warm and natural. The Lex's simple four-knob layout has extra functionality hidden beneath. The sound of a rotary speaker cabinet, originally designed as an adjunct to a Hammond organ, works equally well on guitar and has long had a place in rock and pop history. Of course, being such a massive and heavy electro-mechanical contraption, the original Leslie cabinet was never going to become a popular choice with guitarists for onstage use. "The Lex uses the high-powered SHARC processor to recreate the sound of older analogue technology." But attempts to recreate, or at least approximate, that swirling larger-than-life sound in a stompbox started back in the '60s with the likes of the Univibe. And it continues to this day with this new recently released contender for the crown - the Strymon Lex. The Lex follows the Strymon principle of using digital modelling with a high-powered SHARC processor to recreate the sound of older analogue technology. Powered from a supplied adaptor, it's a squat but reasonably compact pedal with a pair of footswitches - one to bypass the effect, the other to switch from slow to fast speeds and, if held down, to apply a brake to stop all motion. There are just four knobs on the top surface to set the main parameters (fast rotor speed, horn level, mic distance, preamp drive), but they also access a further set of parameters, the secondary functions, when you hold the two footswitches down simultaneously giving access to slow rotor speed, cab direction, acceleration time, and a preset boost or cut when the pedal is engaged. For further control, there's a rear panel expression pedal input with assignable control over any front-panel knob. Alternatively one of Strymon's handy 'Favorite' switches can be plugged in to the socket and used to save your favourite setting or to toggle slow/fast speeds remotely. The pedal takes a standard mono jack input, but also has a pair of jack outputs so you can run it in mono or stereo. In addition, there's a bi-amp mode, selected in a power-up procedure, which will send the bass rotor signal out to the left output, and the treble horn to the right output. The Lex has a very natural sound - a warm, rich and, to our ears, a very detailed emulation of the real thing with a nice sense of dimensional depth. 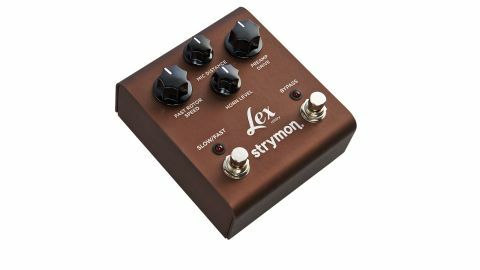 There's no tone control, but Strymon seems to have voiced the Lex just right so that bringing up the horn level puts the top end just where you need it. Valve Leslies when pushed hard were valued for their overdrive and the preamp drive here brings that element to the sound, getting subtly grittier as the knob is advanced, but never swamping the sound even at max. Speed changes are handled well with a natural acceleration/deceleration, and the mic distance knob realistically models real world mic positioning - further out the sound is smoother, closer in you are more aware of the rotation cycles and hear a choppier sound. Overall the available parameter adjustments allow you to realistically reproduce plenty of the variables of a Leslie cabinet's operation. In fact, it's rather difficult to actually dial in a bad sound. There's no doubt that playing guitar through a rotary speaker will give you a multi-faceted sound with lots of subtle nuance that's a challenge to recreate using electronic rather than electro-mechanical means. But recreate it we must if we don't want to be lugging huge cabinets around (not to mention mic'ing them up and servicing them regularly) and this pedal does the job extremely well. To our ears, the Lex offers a highly natural representation of the Leslie speaker sound, with a set of parameters that can shape the sound exactly to taste without straying beyond the boundaries of what the original is capable of. It's ideal if you want to get as close to the real thing as possible. This pedal will provide you with a practical means of joining the rotary club.